Enjoy of a one in a lifetime experience , full of fun and adrenaline. 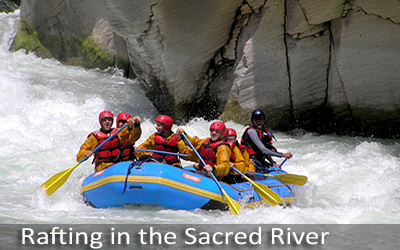 This fulld day tour will take you to the sacred river where you will experience the rapids of this great river, plus you will also enjoy a ziplining and a great lunch. In the morning, your driver and tour guide will pick you up from your hotel in Cusco and will take you to the "Cusipata river camp”, where we can leave our baggage. Here you will enjoy, hot showers, toilets, sauna and a comfortable dinning area. Our Professional River guides will provide you with all the proper Rafting equipment such as helmet, wet suit, spray jacket, paddle and self bailing raft. After a comprehensive safety instruction, you will drive 10 minutes more to Chuqui, where we will begin our rafting adventure with rapids up to class III & III+. You will spend about two hours on the river. Afterwards, we will take you back to the Cusipata River Camp, where a lunch will be served. 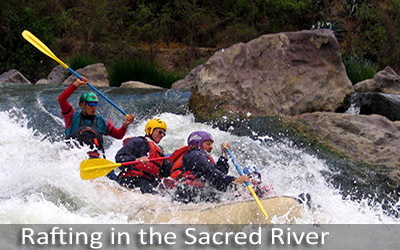 You will also be able to enjoy a sauna or try ziplining over the Urubamba River. After a full day of adventure, we will take you back to your hotel in Cusco.